Smuggling and trafficking networks were put under a harsh spotlight in 2015, their role as intermediaries defining the shape and scale of asylum seeker and migrant flows around the world. While human smuggling is hardly a new phenomenon, the fluid nature of this business model, the huge profits that can be made with little personal or financial cost to those controlling key routes, and the particular dangers of sea crossings have sharpened the international challenge of shutting down these networks. As the Turkey-Greece route has come to dominate flows to Europe, Turkish smugglers pocketed a profit of more than $200 million over the summer alone, charging up to $1,200 per person for an all-too dangerous boat crossing—representing just the tip of what has become a deeply troubling iceberg. Smuggling routes to Europe resemble a vast, complex chain, stretching from points in southern Africa and Central Asia to the Mediterranean. While there is no such thing as a single global smuggling network, routes are developed through a series of systems and crossroads that fan like webs across entire continents. The nationalities of those arriving are diverse, with migrants and would-be asylum seekers engaging multiple smuggling services along the way. In 2015, the scale of traffic along certain routes shifted significantly. Early in the year, the flow across the Central Mediterranean from Libya to Europe captured world attention, with large-scale casualties stemming from overpacked boats navigating open seas. Smugglers on this route have been accused of abusing migrants and abandoning them at sea or sending them without navigators and supplies. In late April, the capsizing of a boat thought to contain 800 migrants and asylum seekers catalyzed a pan-European response. The subsequent launch of the Frontex-coordinated Operation Triton, alongside Italian and privately run vessels conducting search and rescue, contributed to the significant reduction in mortality rates off the Libyan coast, though it is still thought that up to 2,889 migrants had died along that route during 2015 as of December 11. In October, the second phase of EUNAVFOR MED, the European Union (EU) naval operation against smugglers, began, including high-sea boarding, search, seizure, and diversion of vessels suspected of being used for smuggling. With continued instability in Libya and increased monitoring in the Central Mediterranean, the flow shifted over the summer to the Turkey-Greece corridor, with smugglers sending thousands of migrants daily to the isolated Greek islands of the Northern Aegean. But the service does not stop there; smugglers have facilitated the onward journey along an increasingly well-trodden path through Macedonia, Serbia, and into the European Union first via Hungary, and more recently through Croatia and Slovenia and on to Austria, Germany, and beyond. The overwhelming media focus on smuggling routes into the European Union in 2014 and 2015 often obscured other networks operating elsewhere in the world. Key maritime routes across the Red Sea to, and increasingly back from, Yemen, and across the Bay of Bengal from Burma and Bangladesh towards Malaysia, have increased in both significance and deadliness in recent years, and are primarily managed by smugglers. The refugee crisis has revealed the entrenched yet diverse nature of the smuggling industry—and how easily smugglers might be replaced. The smuggling business model is frequently very flat, with operators specializing in a single border region, passing “clients” on to the next smuggler. Vertical criminal syndicates also operate in some regions, with kingpins managing a broad network including local fishermen, drivers, handlers, brokers, and other middlemen. Similarly, there is no single profile of those who might be characterized as smugglers. Researchers have noted that migrants themselves often engage in smuggling activities, to help co-nationals and finance the next stage of their own journey. Other groups are more nefarious, with close links to local militias and other armed groups, as in Libya where there are concerns that smuggling may also fund the activities of Islamic extremists such as ISIS through informal taxation. Finally, links to corrupt government officials can be found at many critical intersections, such as Niger, where corruption is a way of life, and in Thailand, where authorities have largely turned a blind eye to high-level involvement. Smuggling can become deeply entrenched in the local economy at major crossing points, through the development of attendant services from assisting money transfers to selling life jackets, as in coastal Turkish towns, or providing car rides or bus tickets as in Serbia. This poses a significant challenge to authorities seeking to eradicate a smuggling network, as its roots may spread both wide and deep. As particular routes have gained in popularity, and syndicates have shifted from running drugs or arms to capitalize on demand for people smugglers, networks are using social media to attract would-be migrants, openly advertising on Facebook, for example. But social media is also facilitating independence, particularly amongst Syrian refugees. The prevalence of smartphone use means that migrants can use navigation apps to find their way, and services such as Whatsapp to communicate with others making the same journey. Smugglers increasingly have less of a monopoly over key intelligence as information on border crossings, price points, and asylum laws proliferates among migrants. However, as governments strengthen border controls and build fences, smugglers remain indispensable at strategic points along the journey, and can charge a premium when those controls require a change in route. The August discovery of more than 70 bodies in a truck on an Austrian motorway brought home the continued dependence of migrants and asylum seekers on this shadowy sector—and the very high stakes involved. Faced with a flexible, diverse, and seemingly ubiquitous smuggling industry, governments have struggled to respond. Short-term interventions, such as increased border checks and physical barriers have served to displace, rather than reduce, unregulated movements of people, and in some cases, increase smugglers’ business. Authorities have thus found it difficult to effectively balance the dual imperatives of protecting migrants and asylum seekers, while capturing smugglers and dismantling their networks (for more on the EU response, see Issue #1: Migration Crisis Tests European Consensus and Governance). With the launch of the United Nations-sanctioned EU military operation to capture smugglers in international and Libyan waters, some observers have expressed deep skepticism of the impact on smuggling networks and raised concerns of the potential risks to migrants—especially in light of the Thai crackdown on Southeast Asian smuggling networks in May that led to the Rohingya boat crisis, in which smugglers abandoned at sea thousands of refugees and migrants in crowded boats with no fuel, food, or water. Aside from containment activities, governments have focused on improving data and information sharing across agencies and countries. The European Union has created the European Migrant Smuggling Centre to track the finances associated with smuggling networks. Policymakers also have focused on improving cooperation with countries along key routes, and funding programs to build capacity in those countries to counter smuggling. Given the pervasive nature of smuggling networks, and the limited governance capacity in many transit countries to respond, it is unclear if this strategy will pay dividends in the medium to long term. The smuggling industry looks set to remain a pernicious blight for governments attempting to closely manage migration and asylum flows. Crowcroft, Orlando. 2015. Isis: People trafficking, smuggling and punitive taxes boost Islamic State economy. International Business Times, June 16, 2015. Available Online. Cupolo, Diego. 2015. A refugee-based economy grows in Serbia. Deutsche Welle, October 27, 2015. Available Online. European Commission. 2015. EU Action Plan against migrant smuggling (2015 – 2020) COM(2015) 285. Brussels: European Commission. Available Online. European Union External Action Service. 2015. EUNAVFOR MED – OPERATION SOPHIA enters Phase 2. Press release, October 7, 2015. Available Online. Europol. 2015. INTERPOL-Europol forum outlines steps against people smuggling. Press release, October 16, 2015. Available Online. Hubbard, Ben. 2015. 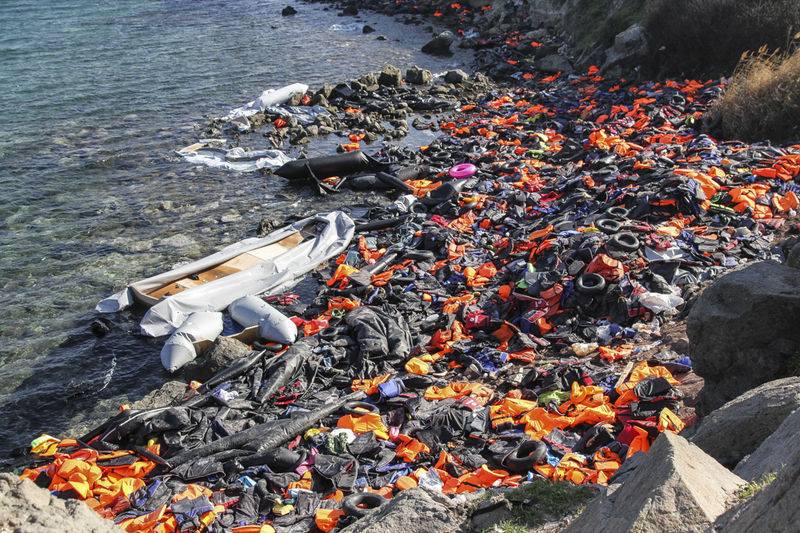 Money Flows with Refugees, and Life Jackets Fill the Shops. The New York Times, September 26, 2015. Available Online. International Organization for Migration. 2015. Missing Migrants Project – Mediterranean. Accessed December 11, 2015. Available Online. Kingsley, Patrick. 2015. On the road in Agadez: Desperation and death along a Saharan smuggling route. The Guardian, November 9, 2015. Available Online. Parkinson, Joe, Georgi Kantchev, and Ellen Emmerentz Jervell. 2015. Inside Europe’s Migrant-Smuggling Rings. The Wall Street Journal, October 28, 2015. Available Online. UK House of Lords, European Union Committee. 2015. EU Action Plan against migrant smuggling, 4th Report of Session 2015-16, HL Paper 46, November, 2015. Available Online.